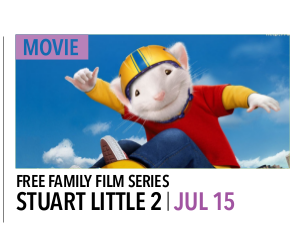 Proctor’s in Schenectady is offering free family movies this summer. Plucky, pint-sized hero Stuart Little (Michael J. Fox) returns to delight audiences with his big heart in this action-packed adventure. Stuart, and the reluctant Snowbell (Nathan Lane) must journey through the city to rescue their new friend, Margalo (Melanie Griffith) from a villainous Falcon (James Woods). Rated PG for brief mild language. 78 minutes. Boog (Martin Lawrence), a 900-pound grizzly bear, is content entertaining tourists and living in park ranger Beth’s (Debra Messing) barn. His life takes a drastic turn when he rescues a one-horned mule deer named Elliot (Ashton Kutcher) from a hunter (Gary Sinise), and is subsequently tranquilized and returned to the wild. Elliot and Boog recruit the other animals, notably a Scottish squirrel (Billy Connolly) and a beaver foreman, to help turn the tables on the hunters to make the woods safe. Rated PG for some rude humor, mild action and brief language. 87 minutes. Surfing means everything to teenage penguin Cody Maverick (Shia LaBeouf). Followed by a documentary film crew, he leaves his home in Antarctica in order to compete in the the Big Z Memorial Surf Off. Cody wants to be respected and admired, and believes that winning the competition will bring him what he craves. However, an encounter with Geek, a washed-up surfer (Jeff Bridges) teaches him what is truly important. Rated PG for mild language and some rude humor. 85 minutes. Find more details and future free movies HERE. This entry was posted in Capital Region Deals, Events, Freebies, Kids and tagged free, Movies, Proctors. Bookmark the permalink.